I love the season of strawberries. Depending as they do on extended hours of daylight, these delectable red berries have always symbolized early summer to me. Overblown and lush, they resemble a perfect June day. Picking them is an essentially lazy, very summery activity. Sitting in a strawberry field on a sunny day, my head shaded with a straw hat and my fingers dyed bright pink from the berries, I think if I can just hold myself still enough I can almost feel the sun stop for the solstice. And if I can be quiet enough maybe—just maybe–I can hear the berries grow. Despite my love of strawberries I only recently learned about the traditions of the Strawberry Moon and the Strawberry Thanksgiving. I stumbled across them last week (if you can stumble on the internet) in an online lesson plan. The strawberry is the first fruit of the new season and as such holds a special place in Native American life. New England Native American tribes designate 13 moons that mark different points in the year. The June full moon (which took place on June 7 this year) is called the Strawberry Moon. In late June the tribes celebrate the Strawberry Thanksgiving. During this festival they give thanks for the early summer’s harvest. The Strawberry Thanksgiving has its own legend, which offers a lesson to Native American children and to us all. In this story a young girl and her beloved brother quarrel about which path to take. She strikes out on her own only to realize that she misses him. She cries–and her tears fall on straw, where berries start to grow. She gathers the berries and brings them to share with her brother. I can well believe that any deity worth his or her salt (or maybe sugar?) would plant strawberry flowers and fruit close to home. And I’m sure that most of us feel much more forgiving after eating this succulent fruit. Next year, I encourage readers to seek out the Strawberry Thanksgiving celebrations in New England, which have unfortunately already ended this year. (I’m sometimes a little slow to pick up on these things!) Plimoth Plantation celebrated its Strawberry Thanksgiving on June 20. The day included singing, dancing, canoe races, a Wampanoag football game, and a traditional clambake (not to mention strawberry shortcake!). The Mashantucket Pequot Museum in Connecticut hailed strawberries on June 12 with music, stories, and games. 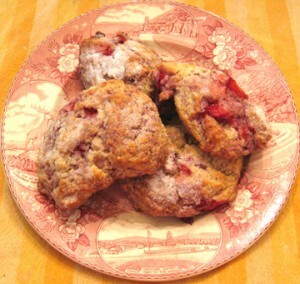 I never met a scone I didn’t like—and these are no exception to that rule! They will brighten any breakfast (or tea). Preheat the oven to 400 degrees. Line a cookie sheet with parchment paper or silicone. In a medium bowl whisk together the flour, sugar, baking powder, baking soda, and salt. Use a GOOD box grater to grate the frozen butter into the dry ingredients. (The large holes are best.) Quickly mix it in with a fork or your hands. In a small bowl whisk together the sour cream, egg, and vanilla. Using a fork stir the sour cream mixture into the flour mixture. Use your hands to press the dough together into a ball. (This may seem a little difficult as the dough will be wetter in some spots than others, but it will work eventually! Place the ball of dough on a floured board and pat it into a circle that measures about 7 inches in diameter. Decisively cut the circle into 8 wedges. Gently place them on the prepared baking sheet. Sprinkle with additional sugar. Bake until golden, about 15 to 17 minutes. Let the scones cool on the cookie sheet for 5 minutes; then either eat them or cool them on a wire rack. Makes 8 scones. 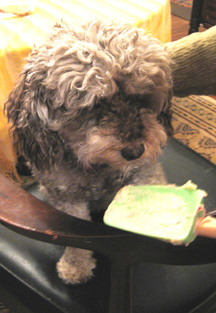 Truffle enjoyed a TINY lick of scone dough. This entry was posted on Monday, June 29th, 2009 at 4:00 am	and is filed under Breads, Muffins, and Scones, Strawberries. You can follow any responses to this entry through the RSS 2.0 feed. You can leave a response, or trackback from your own site. Always enjoy your stories & recipes (through the West County Independent). 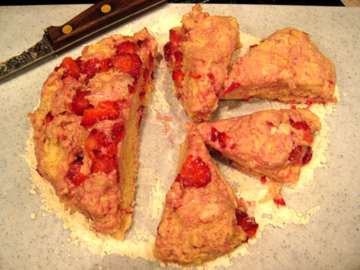 A question on the scone recipe – ingredients include butter but it’s not included in the process….I assume it’s cut into the dries before the sour cream mixture?? or does the sour cream replace the butter?? Oh, my gosh, is my face red! I have fixed the post, but yes, yes, YES, the frozen butter goes into the dry ingredients (with a grater). Thanks for rescuing me–and for being so polite about it (I think I might have said, “Hey, dummy, you forgot something!”)….. I love scones. And I really love your stories too, this time about Berries of the Heart and The Strawberry Thanksgiving. You are on a roll!